Budget camping road trips and earth-friendly adventures to beautiful beaches, national parks and deserts in Baja California, Mexico with a community of friends from around the world. Join us! 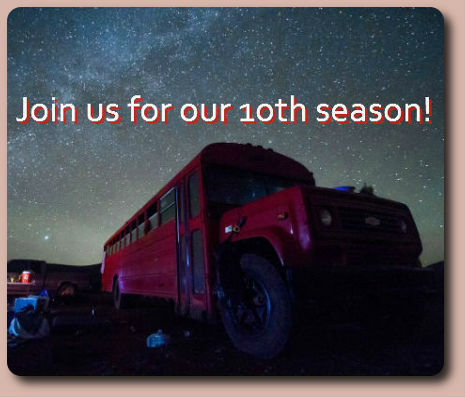 Whether you're Baja backpacking, Baja camping, Baja surfing or just a traveler on a budget, our eco-friendly vegetable oil-powered Baja Beach Bus and Adventure Eco-Vans give a Hostel-on-Wheels and an Off the Beaten Track style of adventure for cost-conscious eco-adventurers and independent travelers alike. Choose the road less traveled and discover Baja California, Mexico as it really is. The Baja Trek concept is designed to be much more than just Baja travel. It's a change toward an eco-friendly and carbon neutral way to experience new places with new found friends from all over the world. It works with the environment. Not against it. We're all about a safe, affordable, full immersion, community-based, earth-friendly experience. Explore pristine Baja beaches, desolate mountains and meet Baja California's wonderful people with fellow travelers. Don't just road trip; save money, help the environment and take a Baja Trek. Sign up to receive emails about upcoming treks, specials and discounts!